What you add in your kitchen: eggs, butter, olive oil, plain yogurt and milk. Awesome product and tastes good. Easy to make. I actually used this pancake mix to make banana bread - there is actually a recipe on Grainstorm's website. Easy and delicious! The only thing I didn't really like about this mix is that it's hard to split the batch (3 eggs, 2T butter, 1T olive oil, 1-3/4 cups yogurt, 1 cup milk). You're pretty much roped into making the entire bag at one time. The upside of that is that they can be refrigerated or frozen and plopped into the toaster or microwave for a quick breakfast anytime. Package says it serves 6. I used a 1/4-cup ice cream scoop of batter per pancake and it provided seventeen 5" diameter pancakes. I used the first pancake as a tester and found it extremely thick so I added about 2 tablespoons of extra cashew milk to the remaining batter, which produced enough for 8 very hearty servings of 2 pancakes each. I love this brand (especially their oat groats!) and all of their mixes are very good. 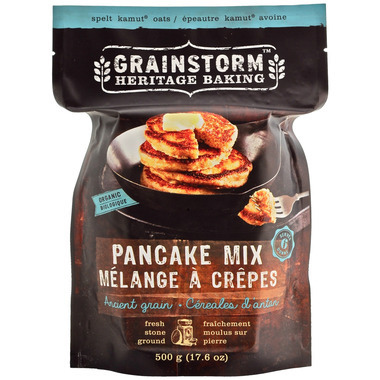 I use their vegan version for this recipe/mix (from their website--it isn't printed on the bag), which makes a pancake that is probably a touch less "elastic" than the egg version, so they're a touch on the crumbly (but light and fluffy!) side. Though good enough to eat on their own, they're delicious with toppings like a tiny bit of softened vegan cashew ice cream and sliced bananas, chopped/minced fresh fruit or berries, or maple syrup. I find the leftover pancakes (if there are any) last fine wrapped up and refrigerated (or left on the counter for a day) and I then just pop them in the toaster to crisp up the surfaces a little when I want to eat them. Typically, for 3 people I make only 1/2 of the package at a time (3 medium sized pancakes per person, and I have a few pancakes leftover so I freeze them to have ready for a quick snack or meal for one. To the 1/2 mix, I adjust the directions accordingly - putting in 1/2 of the suggested ingredients, and then I add one mashed banana, about 3 TBsp hemp hearts and approximately 1/2 tsp of cinnamon (we like cinnamon...), and when the pancakes are cooking, I add about 8 frozen blueberries to the top of each pancake before flipping over. Very nice mix, taste great. I am very sceptical when it comes to premixed products, but wanted to try because of good reviews, and it turned out yummy yummy! I bought this based on other's reviews. This is the best pancake mix I have tried! Love it!! Will buy again. This is very good. I made waffles with it and they turned out great! Wish we could get it in a bigger bag. This is a special product that makes fabulous pancakes you can feel great about serving your family. Expensive though. Will only be purchasing as a treat. I use this delish mix as a base for very tender/ tasty pancakes. I add some organic unbleached wheat flour ... little extra Organic Baking Powder.. smashed half a banana.. melted butter ... and egg beaten with some milk . ( all to desired consistency. Serve with organic Butter and Maple syrup. Will purchase again... great product. I use this as waffle mix and it's one of the best out there. This is the best pancake mix I have ever had it takes like the ones my Mom used to make will be ordering more in the new year. I'm glad I bought 2 when I saw that Well.ca carried this brand. I Love grain storm. Easy to make, but I didn't like these at all. This is my absolute favorite pancake mix! It is hearty but still light. 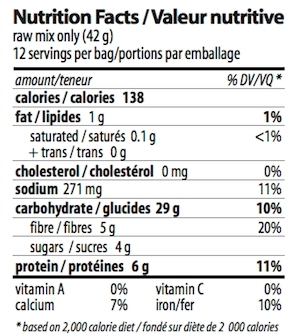 It is healthy but doesn't taste bland like most healthy mixes. My whole family loves it! It is easy to make and cooks up perfectly golden. I will buy this again and again.